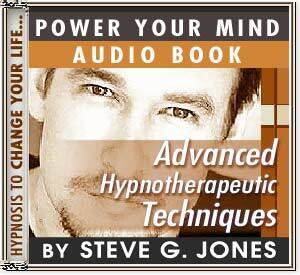 This audio book is designed for those who already have a basic knowledge of hypnosis. In his first book, “An Introduction to Hypnosis,” Steve G. Jones teaches the basics: Inductions, deepenings, scripts, amnesia, and trance termination. I have an audio book called “Advanced Hypnotherapeutic Techniques.” This audio book is for people who want to go beyond the basics of hypnotherapy. Perhaps you are looking for a new career and you think that you have finally chosen your path. Or perhaps you would like to learn hypnosis so that you can use it on yourself (self-hypnosis). No matter what you reason is for learning about hypnosis, this audio book is a great way to learn more about hypnosis!